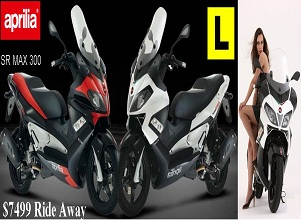 Designed with the young rider in mind, the Aprilia SR MT (Motard) is Aprilia’s new budget priced performance scooter to replace the very popular Sport City 50 & 125cc models. pronounced “beak” nose reminiscent of the off road bikes. The character is true to the Aprilia sports DNA offering unrivalled performance, handling and agility in traffic and backed up by confidence inspiring braking from the hi-performance dual piston front brake caliper and 220 mm front disc and powerful 140 mm mouldable rear drum braking system and this combined with a grunty yet powerful 125cc engine makes the SR MT 125cc the ultimate choice for cost effective urban commuting.